Self-driving cars are all over the news these days, and the rapid pace of development shows no signs of slowing down, as we saw at CES in January. So when will you, an ordinary man or woman on the street, be able to take a trip in an autonomous vehicle? There's a lot of testing underway at the moment, but not only does the tech need to improve, governments across the world need to give the thumbs up to make these cars road-legal before anyone of us can actually get behind the wheel (if there is a wheel...). Self-driving cars are already on public roads but they're not available to the public. They need special licences from the authorities, and they must always have a human driver in place as a back up - those are two restrictions unlikely to be lifted anytime soon. 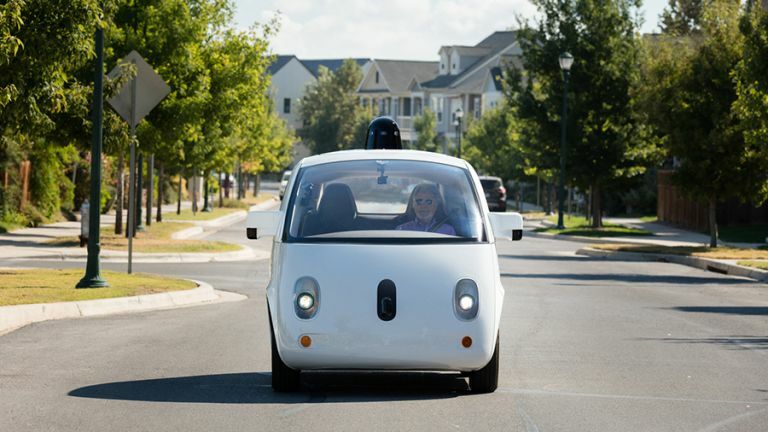 Google is one of the companies that's been working on self-driving technology the longest, and its efforts have now been spun out into a separate company called Waymo. Testing continues across several different sites in the US, sites where Google can get the detailed mapping information it needs to keep the cars informed and on the road. Uber has also started public trials in Pittsburgh in the US, and in partnership with Volvo it says it wants 100 autonomous taxis on the road this year - though they'll all still have a human backup in the driver's seat, of course. Meanwhile Tesla is making big strides forward too, rolling out software and hardware updates for its cars that improve their autonomous capabilities little by little. Its Autopilot system can already drive a car better than a human, Tesla says, though right now you're only legally allowed to use it to help you stay in lanes on a motorway, change lanes when needed, and adjust the car's speed based on the traffic around it. On top of that, all the major traditional car manufacturers are working on self-driving technology of their own. It's a busy field. Right now self-driving cars are perfectly capable of driving themselves - just check out Tesla's demo video for evidence. However, the tech isn't perfect yet - or as near to perfect as it needs to be. Self-driving cars currently require a lot of information about the routes they're travelling on, plus very clear and visible road markings. They don't like bad weather or unfamiliar routes. Regulatory approval for all of this is going to lag some way behind the tech itself, but before it becomes legal for anyone to go and buy a self-driving car and then settle down to watch a movie in the back seat while it gets from A to B, government authorities need to know the hardware is going to work well in every scenario - not just for a few patches of California in bright, sunny weather. That means dealing with unexpected rain, unmapped changes to roads, roadworks and swerving cyclists. If you think about everything that you come across when you're out on the road, that's a lot for a computer to take in and prepare for. When it is ready for primetime though, it's going to be a significant upgrade over humans. Advanced cameras and radar can detect nearby objects much better than our own eyes, whether it's a car way ahead in the fog or a pedestrian hidden by a hedge. Regulatory bodies are also inevitably going to insist that these cars can talk to each other. Imagine not having to guess what the car in front or behind is going to do, because its on-board computer will let you know exactly what its intentions are - and all of this will happen automatically in a split second. So where is improvement still needed? Various comments from the companies involved suggest self-driving cars can cope fine with rain and snow, but only until it gets really bad - much like a human driver, then. They still need extra tuition for when the weather gets really foul or the roads are particularly treacherous. They also struggle with complex traffic situations (again, just like humans). If there's a lot going on, and the on-board computer can't work out what's happening, then the autonomous vehicle might just come to an abrupt halt. Sunlight streaming in at a tricky angle and unidentified objects at the side of the road can also cause problems for self-driving cars - we can tell the difference between a red balloon and a red light, but can an autonomous vehicle? Bridges cause difficulties, because cars have fewer points of reference to use to work out where they are, and so do built-up cities where there are a lot of different objects to keep track of and where getting an accurate GPS lock can be difficult. None of these problems are insurmountable though, and test vehicles are collecting data all the time - every mile that an Uber or Google car drives is another bit of data the underlying systems can use to improve themselves. Technically, self-driving cars are already on the road, thanks to Tesla, Uber and others - but of course they're not legally allowed to fully drive themselves yet on public roads, and may not be for a while yet. Even Tesla would say it's Autopilot technology isn't ready to be used every time, all the time right now (it calls Autopilot a "public beta"), even if it works well as a kind of advanced cruise control when you're on the motorway. The tipping point may well come when Tesla is able to prove a certain number of accidents could have been avoided if its autonomous tech was switched on - when that moment comes authorities will have to sit up and take notice. Predicting when self-driving cars will become road-legal is pretty much impossible though, so we can't give you an exact date. Google and others have said 2020 is a reasonable assumption for when the first wave of fully self-driving cars will go on sale, but whether you'll be able to use all of their features by then is another matter. We're definitely talking within the next five years though, such is the pace at which this technology is being developed. Within a decade we'll all certainly be sitting in self-driving cars, if we want to be, even if they're only allowed to take control at particular times and in particular scenarios. In short, you might want to hold off on that motor upgrade for a year or two.